Still from the video clip to the TJ Eckleberg remix of the Tom Kazas song, Transfusion. A: Interesting you should say that, because working on the video clip to Transfusion -TJ Eckleberg remix brought back some of my curiosity about the links between topology and psychoanalysis. It reminded me that the lyrics to Transfusion are from the time I was making my cinema poem (short-film) the Topologist, that in many ways was trying to explore these connections. In simple terms, topology is study of the folding of space, the preservation of properties of space under transformations. 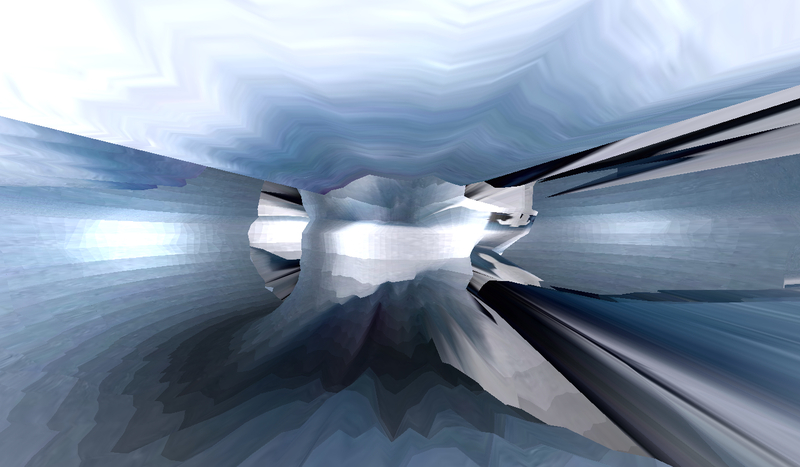 This subject matter can also be imagined as the terrain of unconscious drives and desires; where separated histories and urges can come into connection, or where accepted associations become disconnected, where shape does not have to correspond to content, and where visually, (in a somewhat literal rendering for the Transfusion video clip), a multi-surface multi-angled scene represents such psychoanalytic structure and tension, or torsion, if you will. Loss, not only of present fixed co-ordinates, but of nostalgic co-ordinates and future co-ordinates, requires (and required of me in the making of the Topologist), a new way of seeing the world. Some of these ideas were expressed via the narrative (or more appropriately the anti-narrative) of my film the Topologist; with its unidentified polyvocal voice-overs, its episodic sequences, and its representation of no ‘real-world’ terrain, that tries to question metaphor. With the video clip to TJ’s remix, all this was able to come together in a new way with the inclusion of the 3D image manipulations I created of a still from the Topologist. These image transformations (as seen in the image above) depict this multi-dimensionality and contrasting orientations, with that tiny figure of the topologist himself present in some of these Escher-like and Dora Maar-like scenes. I was thrilled that TJ’s remix focussed on the lyrics: “I stepped out of the water, walked in from the weather”, because this couplet condenses the idea of transition from one terrain to another, of transformation from one shape to another that struggles for coherence. It poses an escape from a dense bounded space (in the lyric: a bathtub) to a somewhere-else, from a site of elemental turmoil (in the lyric: the weather) to a new space, that in many ways become equally challenging for the topologist. You see, as experimental as I tried to make the Topologist, that is, with its non-narrative features, the lyrics to the song Transfusion are certainly narrative in form. Namely, they describe a journey over time, where this movement can be plotted and its parts related, intentionally problematic as they made be. Elements of the ‘absurd’ now enter, especially with the sense of the absurd that Camus wrote about in his treatment of the myth of Sisyphus. That book became inextricably linked to my lyrics, that found some form in: “I revel in the burden that’s rolling up and down the hill.” But Camus’ book, the Myth of Sisyphus, deals with so much more. For example, how suicide as a response to the absurd is not an acceptable option; not a somatic suicide, not a psychological suicide, not an abandonment or apathy. But it precisely identifies the need for struggle, for a freedom that only becomes intelligible in the face of the absurd. One begins to see the political in this story. What became interesting to me were the deeper layers to the character of Sisyphus. Sure, he was given an absurd punishment, but Sisyphus is not simply a criminal, nor a simple criminal. He can be understood as a hero. The Greeks certainly rendered him as such. He was a hero that challenged and disobeyed authority, the Law. He was equated with that other great hero who disobeyed authority, Prometheus. Prometheus was also given an ‘eternal’ punishment, but we celebrate his crime because it becomes the very beginning of humanity; we understand this act as a gift. However, this gift is not just that of fire, (the arts of civilisation), but one of the ‘act of disobedience’ itself. Eric Fromm identifies that civilisation can be understood to have been founded with acts of disobedience. It was this Promethean disobedience that brought civilisation to humanity. In the biblical myth, it was Eve who disobeyed and precipitated the Fall, that allowed humanity to begin. These Western creation myths embody, at their very heart, acts of disobedience. It is not a stretch to see that for society to evolve, at many levels, we need to acknowledge this deeper sense of the role of disobedience. (Fromm is clear to differentiate between the right and wrong kinds of disobedience.) Authority, whether political, economic, patriarchal, theological, cultural, etc, needs to be challenged by humanity for society to exist. For me, this is a crucial insight. Sisyphus, in the hands of Camus, becomes a character that disobeys, rebelling against the absurd of his situation. It is in this act that a deeper sense of emancipation is created; a rupture in the repetition. As Camus writes, “one must imagine Sisyphus happy,” and happiest in this situation. So that if freedom means anything, it means a predicament that necessitates struggle, and so this becomes the definition of happiness. These ideas were irresistible to me, so I had to title my ep, (the one that contains my mix of the song Transfusion), ‘Sisyphus Happy‘. I won’t go into it here, unless you ask me a question on this, but the other major theme on that ep is the tension between presenting different remodellings of one song on the same ep. (There is yet another version of Transfusion, on this ep, called Revel in the Burden). The ep problematizes ideas of the original versus the copy, of cause and result, and of discovering alternate meaning by juxtaposing these remodelled versions. It comes full circle by trying to equate these songwriting ideas with the Sisyphean moments between ascent and descent. Trying to make sense of all of this can be seen as an act of transfusion; of absorbing this absurd predicament as a life generating act, even as a therapeutic act. My lyric, “I read words for transfusion” not only references that act of reading Camus’ book, but also that words and language, with their structures (and poststructuralist implications), are a way to allow/restrict movement inside this topological terrain. I have never written many narrative song lyrics, and when I do, they generally start off as word poems, with the poetry of the music arriving much later. This entry was posted in culture, film, music, politics, works, writing by tomkazas. Bookmark the permalink.